By Sam Smith | 12.30.2015 | 10:00 p.m. The Bulls Wednesday defeated the Indiana Pacers 102-100 with the most unlikely game winner, a Pau Gasol lob pass to Jimmy Butler on a back door cut for a tip in. It was the kind of spectacular score you’ll be seeing on highlight films for years to come. The Bulls overcame a seven-point fourth quarter deficit with 2:35 left to tie in regulation on a pair of Butler scores. Indiana missed at the buzzer. The Bulls took a 98-91 lead to start overtime, but the Pacers with 16 offensive rebounds fought back, Monta Ellis with a three to tie the game before the Gasol/Butler connection. Aaron Brooks led the Bulls with 29 points with Butler adding 28. Gasol had 13 points and 11 rebounds and Taj Gibson had several big defensive plays in the overtime to save the victory. The Bulls moved to 18-12 while the Pacers are 18-13. George Hill had 20 for Indiana. Bobby Portis added 16 for the Bulls. It was bad news before the game for the Bulls that turned the game into a slow down contest as Derrick Rose was declared out with a tight hamstring. Kirk Hinrich started. It wasn’t considered a serious problem for Rose, but teams don’t like to take chances with potential hamstring injuries. Joakim Noah remained out with his shoulder injury, but Doug McDermott returned from a mild knee strain. But without Rose the Bulls’ pace and speed slowed noticeably as the Bulls shot in the last five seconds their first eight possessions and once didn’t even get into the front court fast enough. But the defense held with the teams tied at 21 after one quarter. Portis gave the Bulls a boost with his spirited play late in the first quarter into the second as with he and Brooks the Bulls pulled ahead 36-30. The Pacers rallied within one, but Brooks added two late threes to send the Bulls into halftime leading 50-40. Brooks had 18 and Portis 10 at halftime, both off the bench, to lead the Bulls. The Bulls seemed in control of the game taking a 54-40 lead shortly after halftime. 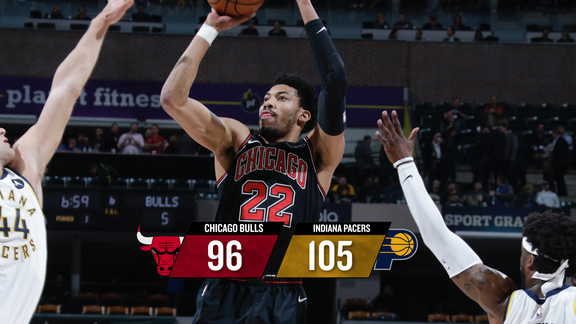 But the Bulls then looked like they were standing in drying cement as the Pacers grabbed seven offensive rebounds in a 19-4 stretch over six minutes to take a 59-58 lead. The Bulls finally got on the defensive boards late behind Portis and Taj Gibson to inch ahead 66-62 heading into the fourth quarter. The Pacers took an 82-75 lead on a 12-0 run, but the Bulls fought back behind Butler to tie with 25 seconds left. Butler in a tough shooting game finished the regulation strong with a three pointer and hard driving score in the last 35 seconds to match Pacers’ scores and tie the game. Butler had 11 of the Bulls last 16 points in the fourth quarter.